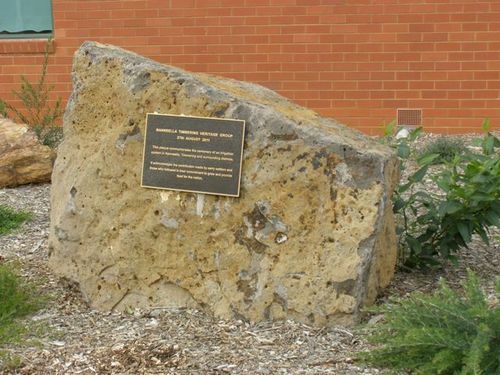 Plaque commemorates the centenary of the irrigation system in Nanneella, Timmering and the surrounding districts and pays tribute to the pioneers. few miles of the town of Dublin. In March, 1911, these three raw Irish immigrants arrived in Victoria. and selected the irrigation blocks which they now hold. Since then they have applied themselves so industriously and skilfully to the problem of rendering their enterprise fruitful that already a marked degree of success has attended their efforts. Steadily improving the land and rendering it productive, Messrs Jacobs and Kennedy--who never before had performed rough manual labor--soon had a large area under lucerne and various fodder crops. Previous to this stage they had applied themselves vigorously to the eradication of all rabbits in the near neighborhood. Leader (Melbourne), 25th July 1914.
system in Nanneella, Timmering and surrounding districts.